Richardson, TX – May 2017… Recognized as one of the leading performing arts facilities serving the Dallas/Fort Worth area, Charles W. Eisemann Center for Performing Arts is home to entertainment and cultural activities that include dance, musical theater, concerts, corporate meetings, cultural celebrations and city functions. With such a range of activities, the ability to clearly project everything from business presentations to theatrical backdrops is crucial to the success of many Eisemann Center events. To ensure the best image projection for its varied clientele, the Eisemann Center recently upgraded its projection capabilities with new equipment from California-based Eiki International, Inc.
As part of the Eisemann Center’s technical production team, Cody Williams, Video/Media Technician for the City of Richardson, and Virgil Justice, Assistant Technical Manager, oversee equipment, event production and show and presentation logistics. Williams and Justice discussed the challenges they encounter, and their decision to deploy two Eiki EK-800U Widescreen Projectors. 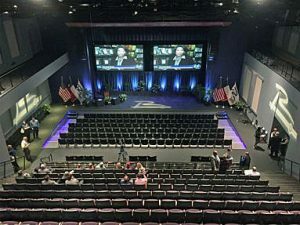 For more information about the Eisemann Center for Performing Arts, visit www.eisemanncenter.com or call 972-744-4600.